Honored to receive an Arts Writers Grant from Creative Capital/Andy Warhol Foundation for my blog IN/SITE: Reflections on the Art of Place. So grateful for their support. Tune in to the divine KT Hawbaker, me, and the cast of Bad@Sports as we review the highs and lows of this year’s EXPO Chicago, the international fair of contemporary and modern art. Thrilled to be a Mentor for Burnaway’s Art Writers Mentorship Program this spring. I’ll be in Atlanta May 17-19, where I will give a public talk “Peripheral Visions: Sightlines for Today’s New Arts Journalism,” and then work with program participants to hone their critical writing skills. Please join me at the Museum of Contemporary Art on Friday, January, 12, 2018, at 6pm, where I’ll be hosting a brief panel and workshop, as part of Edra Soto’s Open 24 Hours, part of the MCA’s new Commons Artist Project space. Entitled “Muralla Alta/High Wall,” audiences are invited to meander through a visual experience that includes a narrative installation of 35-mm slide projections, co-organized by Soto and Daniel Hojnacki, and to create their own written and visual responses. For more information. Please join John Preus and me for Homecoming, a public reception and exhibition tour of “Infinite Games 50/50” at Open House Contemporary, 740 N Ogden Avenue, this Wednesday, October 25, 7-10 pm. Join me and colleagues Barbara Jaffee, Freida High W. Tesfagiorgis, Joanna Frueh, and Leslie Bellavance, for the panel “Women Writing about Art,” 12:45-2:15 pm on Friday, November 3, part of the symposium Transforming Culture and Society: Midwest Women Artists, 1960s-1980s, November 2-3, 2017, at Bradley University in Peoria, Illinois. 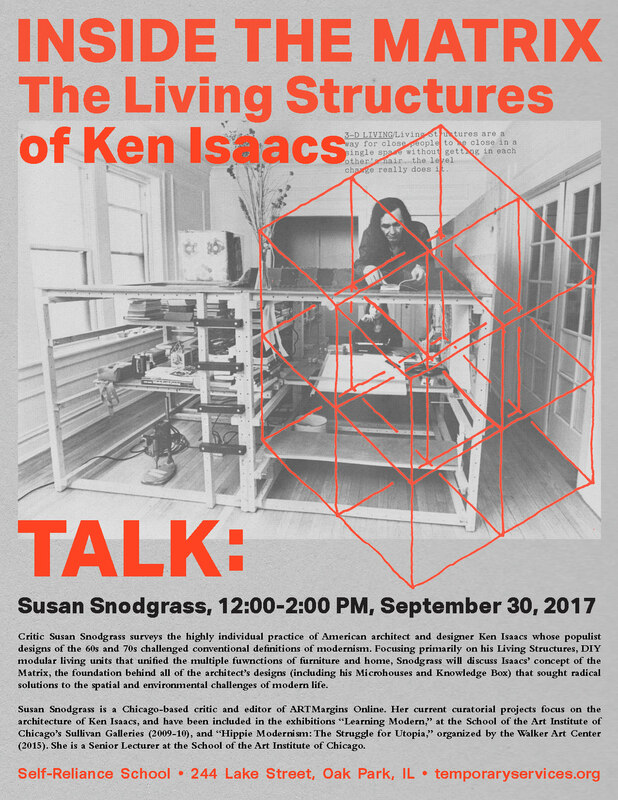 Come hear my talk, “Inside the Matrix: The Living Structures of Ken Isaacs,” September 30, 12-2 pm, at Compound Yellow, 244 Lake Street, in Oak Park, IL, organized as part of the Self-Reliance School by Temporary Services. Free and open to the public.